Karel van Mander III, Hydaspes and Persina Making Love, circa 1640. Oil on canvas, 110 by 220 cm. Kassel, Gemäldegalerie. The image is the first in a series of 10 large canvases by the Dutch artist Karel van Mander depicting a remarkable tale of love, misadventure and reconciliation. The paintings illustrate the complex narrative related in The Aethiopica, a late antique novel written by Heliodorus of Emesa in Syria. The epic became popular in the 16th century when it was rediscovered and translated from the original Greek. The Aethiopica flashed across the skies of the European visual imagination amid an energetic burst of interest in the story for about 50 years and then mysteriously declined. The story begins in the middle with an encounter with pirates by the two protagonists: Theagenes, a descendant of Achilles, and Chariclea, a priestess of Artemis at Delphi. Only at this point is an amazing backstory revealed: Chariclea turns out to be the daughter of King Hydaspes and Queen Persina of Ethiopia. During conception, which is about to take place in the picture here, her mother had looked at a painting of the mythical Greek figure Andromeda. In accordance with the theory of maternal impression, still current when this image was painted, this gaze caused her child to be born white. Fearing an accusation of adultery, Persina abandoned her daughter, who was eventually adopted by Charicles, a Greek priest. After many adventures, she and Theagenes arrive in Meroe, the capital of Ethiopia. Chariclea is reunited with her parents, and the couple weds. Of the many depictions of The Aethiopica, van Mander was the only one to unambiguously embrace this distinction of black and white. He treated the whole course of the narrative, not just the episodes taking place outside of Ethiopia, while most of his contemporaries significantly downplayed the blackness of Hydaspes and Persina. He brings this ancient tale to life through a vigorous, unrestrained treatment of action and facial expression, and a lively portrayal of the black protagonists. In fact, there is evidence that at least some of the figures were based on actual models — that is, black people living in northern Europe, most likely Denmark, where Van Mander was serving as court painter when the series was created. To a modern audience, the story of Theagenes and Chariclea, with its seamless connections among the people and cultures of Greece, Egypt and sub-Saharan Africa, may offer a corrective to the more one-sided view of classical civilization that subsequently developed in the European consciousness. Martin Bernal, in his insightful study Black Athena, critiques this received tradition and argues for the essential role of Africa in the development of Western civilization. 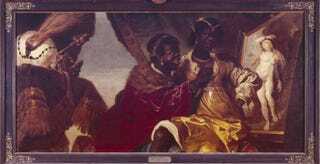 We can see a precocious foreshadowing of his point of view in the freshness of van Mander's presentation of the royal court of Ethiopia.